Posted July 3, 2017 in K100. “Brother Eye And Buddy Blank” is the 20-page debut story from OMAC #1 , a debut for a new character by Jack Kirby, inked and lettered by Mike Royer. Brace yourselves for “The World That’s Coming”. 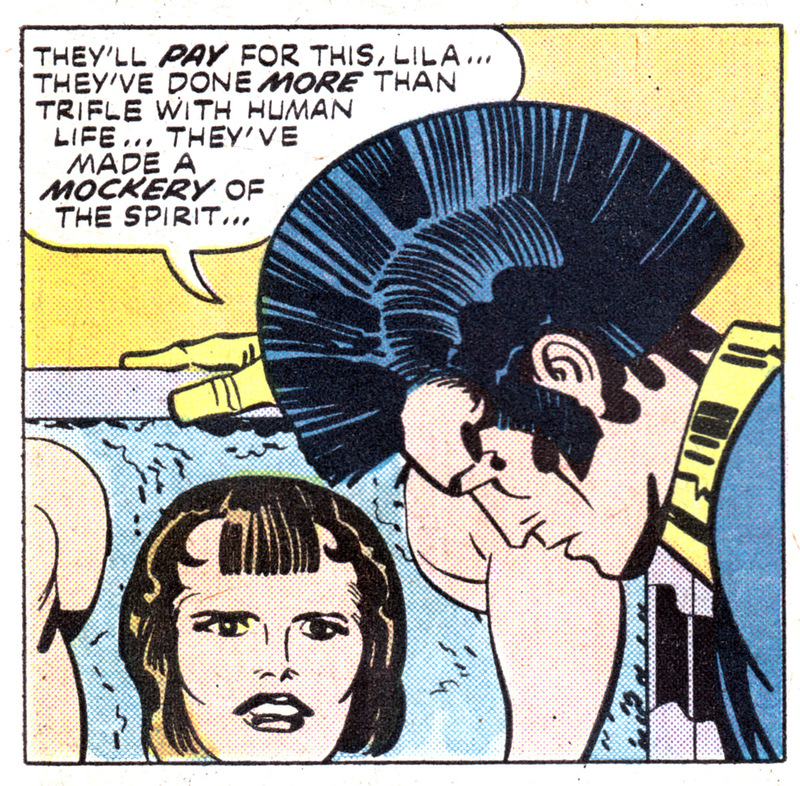 OMAC #1 is some strange stuff even by 1970s Kirby standards. What can you make of a book that opens with a full page splash of a disassembled robot woman “Build-A-Friend” in a box saying “Hello — Put me together and I will be your friend”? Also, kind of an unusual story structure for Kirby, as he opens with the climax of the story, then has a flashback to the origin building up to the first scene and then the conclusion. It works pretty well, as it moves the action right up to the front and sets up the rest of the issue nicely. After seeing OMAC bring down the Build-A-Friend shop, we flashback to his origin, as the faceless Global Peace Agency tell Dr. Myron Forest that they have selected Buddy Blank to be the subject of the OMAC Project, leaving Forest to activate the sleeping satellite Brother Eye. After a view of Buddy’s life at the offices of Pseudo-People, Inc. and some bizarre scenes of their “psychology section”, we see that he was befriended by the previously revealed to be a Build-A-Friend Lila, as part of an experiment in making lifelike beings. As Buddy stumbles onto the secret section and finds out the secret of Lila and the nefarious assassination plans she’s to be part of, Brother Eye transforms him to OMAC. A wonderful issue, brilliant in its almost pure expression of imagination, Even the artwork seems like a heightened pure version of Kirby. Thanks to MIke Royer for inking my favorite Kirby pages. Perfect villains for Kirby, business mens, and Mr. Hoppe. ? 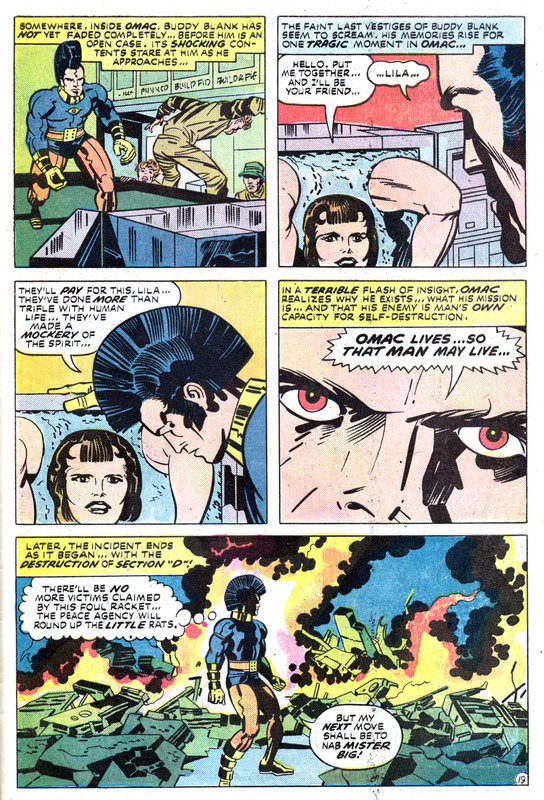 THanky Did not remember those flames, merely a riot, nevermind OMAC started it, goes without saying HE was a good dude. Good choice of panels, reminding us of those panels where The boy and Ula are relating as close to futuristicly as possible aren’t they backgrounded by the ultramodern grounds of the World Defense Organization. I think, she worked as a low level functionary for the world INterference Organization, I think, meaning for who ! Buddy Blank worked.